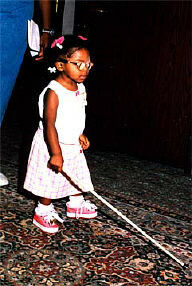 Mikaella Besson of Massachusetts has a lesson using her white cane during the cane walk. ����������� From the Editor: The events planned for parents of blind children and their entire families at our annual conventions have become so numerous that it seemed to make sense to pull them out of the previous article and give them space of their own. Barbara Cheadle is President of the National Organization of Parents of Blind Children. She and her board have planned all these activities. Just read through them and anticipate what fun families attending this year's convention are going to have. ���Last year's casual, family-oriented start to our traditional parent/teacher seminar day was so popular that we are repeating it (with some modifications) this year. From 8:00 to 10:30 a.m. adults and children can gather to sign in for the NOPBC events, look at exhibits, relax with a cup of coffee or glass of juice, participate in a kid-friendly convention-orientation session, and meet some wonderful people who share a common quest for knowledge and understanding about blindness. ���Families can browse through six exhibit tables and pick up materials about blind and multiply disabled children, music education for blind children, low-vision, and schools and programs serving blind children. Families may also want to stop by the mentor table. Once again the National Association of Blind Students (NABS) will match children ages twelve and older with a young adult blind mentor for the duration of the convention. After exchanging room numbers, parents and mentors can work out their own schedules to meet. Parents will also have the chance to sign up for a mentor: specifically, a blind member of the NFB in Computer Science Division to accompany them through the Exhibit Hallan Exhibit Hall mentor. We will have a special exhibit table just for kids, too. The activity at this table will help kids break the ice in meeting other kids and learn something about famous blind people to boot. ��� Parents will also have plenty of time to check in pre-registered children for NFB Camp. The camp opens at 8:30 a.m., but the seminar session for parents doesn't begin until 10:30 a.m.
����At 9:00 a.m. parents and other adults may continue to talk, look at the exhibits, or quietly listen in on the Kid Talk and Introductions, led by NOPBC President Barbara Cheadle and Sheila Koenig. The talk will actually be a dialogue between the kids (blind and sighted) and Mrs. Cheadle and Miss Koenig about unique features of NFB Conventions that are interesting or puzzling to kids. Each kid will then get a chance to introduce himself or herself over the microphone. �����Everyone will then be called to order to hear the official convention welcome from NFB President Marc Maurer, followed by introductions of the Braille Carnival Buddy Volunteers. Sheila Koenig, coordinator of the Carnival Buddies, will answer any questions about the Carnival, and she will explain how the volunteer Carnival Buddy system will work. Children and youth ages five and up may register to attend the Carnival with a Braille Carnival Buddy (all youth under the age of seventeen must be supervised by an adult at the Carnival). ���The Braille Carnival will feature exciting and fun games, competitions, demonstrations, and prizes with Braille themes. Carnival booths are sponsored by NFB divisions, state affiliates, NFB Centers, and residential schools for the blind. Sighted or blind, Braille reader or non-Braille reader, kindergartner or teenagerlots of enjoyable activities will be available for all. The carnival will run from 10:00 a.m. to 1:00 p.m. The carnival Buddies will supervise the children and youth assigned to them from 10:00 to fifteen minutes after adjournment at noon. The Carnival will stay open till 1:00 p.m. so parents, too, can enjoy the carnival fun. ����Also beginning at 10:00 a.m. will be two discussion groups for blind teens ages thirteen to eighteen. The session for blind teen women is called "What Your Mother Couldn't Tell You," led by two blind women: former social worker Debbie Stein and professor of ethics Dr. Adrienne Asch. The discussion group for blind teen men is "Guy Stuff" and will be led by social worker Doug Elliott (also blind). Teens who choose to attend the discussions will have a chance from noon to 1:00 p.m. to enjoy the Carnival, too. ���� After children and youth are settled into their activities--NFB Camp, Blind Teen Discussion Groups, or the Braille Carnivalparents and adults can sit back and enjoy the morning seminar session beginning at 10:30 a.m. This year's theme, Let Freedom Ring, obviously inspired by the historical significance of our convention city, Philadelphia, will lead us into exploring what freedom and equality mean in the education and lives of blind children. ����At noon everyone breaks, and families re-unite for lunch. Parents have a grace period of fifteen minutes after the session adjourns to pick up kids at NFB Camp and a slightly longer pick-up time at the Braille Carnival or the teen discussion groups. At 1:45 p.m. parents can check pre-registered children into NFB Camp for the afternoon, then head off for the concurrent small-group workshops of their choice. Parents will have up to thirty minutes after the workshops end at 5:00 p.m. to pick up children from NFB Camp. ����Five repeating workshops are offered in the afternoon for adults this year. Make Your Own Tactile Storybook will be repeated twice, from 2:00 p.m. to 2:30 p.m. and from 3:45 p.m. to 5:15 p.m. This is a hands-on workshop to teach parents how to modify storybooks so blind infants and toddlers can get information and pleasure from storybooks equivalent to what their sighted peers get from the pictures. Karen Frank, Infant and Toddler Outreach Coordinator from the Maryland School for the Blind, will conduct this workshop. ����The following four workshops for adults will be repeated three times: 2:00-2:45 p.m., 3:00-3:45 p.m., and 4:00-4:45 p.m.
����������� 1. Words and Wheels. Through discussion, demonstrations, and role-playing, parents and educators will learn how blind people obtain and use live readers and drivers to maximize independence in everyday life. ����������� 2. What Do You Do When....? Through discussion, demonstrations, and role-playing, blind and sighted leaders will help parents and educators feel more confident about knowing when and how it is appropriate to offer assistance to someone who is blind. ����������� 3. From Helpless to Helper. No one wants to be helpless. This workshop is a presentation by parents to parents about how to ensure that blind children avoid helplessness, achieve self-sufficiency, and acquire the competence and skills necessary to become a person who makes a contribution to others. ����������� 4. Living in a Visual World. Once again Barbara Pierce has agreed to lead a discussion about how parents and teachers can help blind children acquire crucial social skills in an often highly visual world. � For teens, both blind and sighted, there is a fun-filled session from 2:00 to 4:00 p.m. called "Words, Wheels, and Ways," coordinated by Melissa Williamson, a blind educator and mother of three. Through discussion, role-playing (including role-reversals), and friendly competition (with prizes), blind and sighted teens learn about using�or being�readers and drivers. (Do sighted siblings and sighted kids of blind parents know that they can get paid to be readers and drivers?) They will also discuss how to give directions; how to offer, accept, or decline assistance; when and how to offer (or use) human-guide assistance; etc., and then discuss how they can implement this knowledge throughout the convention. ���This year, as in past years, families can relax and enjoy the company of new friends and old at Family Hospitality. NOPBC will also have a few games�including the popular Bop-It game�and books in the hospitality room to help occupy children ages eight and younger. For all kids (sighted and blind) ages nine and up we will again offer our traditional Teens' Scavenger Hunt (ages thirteen to eighteen) and Kids' Scavenger Hunt (ages nine to twelve). Under adult supervision kids and teens can explore the hotel and win prizes. To add to the fun and enhance the educational aspects of the game, sighted youth are issued white canes and sleepshades (blindfolds) to use on the hunt. Cane Walk. This session will be repeated twice: 9:00-10:30 a.m. and 11:00 a.m.-12:30 p.m.
���Parents of blind kids of all ages (babies to teens), teachers, and blind kids can get hands-on experience in using a cane in the hotel under the guidance of volunteer instructors from the Louisiana Tech/Louisiana Center for the Blind O&M program. Joe Cutter, pediatric O&M specialist, will provide the demonstration for parents of pre-school children. 2:00-6:00 p.m. Teen drop-in room sponsored jointly by NOPBC and Blind Industries and Services of Maryland (BISM). ���This is a supervised place for teens to gather and get to know others attending the convention. 7:00-9:00 p.m. IEP and IDEA drop-in question, information, and resource session. ���Come by anytime and pick up literature or talk to parents and professionals knowledgeable in the broad range of IEP topics. Marty Greiser, Coordinator. 2:00-6:00 p.m. Have Cane, Will Travel. Drop-in-anytime discussion group for parents, blind kids, and teachers. Joe Cutter, instructor and discussion leader. 2:00-6:00 p.m. Technology: Individual Consultations. Co-sponsored by the NOPBC and the NFB in Computer Science. ���Blind people knowledgeable in technology will meet with parents individually to discuss the technology needs of their child. Appointments can be made at the mentor exhibit table Sunday morning, July 1, at the NOPBC Seminar meeting room. Drop-ins will be taken if we have available volunteers. 2:00-4:00 p.m. Braille Your Own Games and Braille Talk. ���Come by anytime and bring your own games for Braille labeling, or bring your questions about Braille or your child's Braille instruction. Co-sponsored by NOPBC and the National Association to Promote the Use of Braille. ���Blind adults skilled in Braille will be on hand to answer questions about Braille or help you add Braille labels to a favorite game. We will also give lessons in slate-writing. If you don't have a game to bring, we will have decks of playing cards and UNO cards you can buy, which we will help you Braille on the spot. ���NOPBC Activities Fee: $15 per family or $5 per individual. �Families or individuals may pay in advance or pay when checking in at the NOPBC Seminar on the morning of Sunday, July 1. The activities fee covers all NOPBC-sponsored events throughout the convention week, including refreshments or snacks served at NOPBC events, the seminar and workshops for adults, the Braille Carnival, youth activities (workshops, discussion groups, scavenger hunts, teen hang-out room), family hospitality, and Cane Walk. It also includes annual membership dues in NOPBC. ����������������������� ����������� ����������� * What Do You Do When...? Workshops A and B are drop-in-sessions. Bring the kids with you. Workshop C is by appointment, but drop-ins are welcome if volunteers are available. ����Note: Pre-registration for the NOPBC seminar and workshops is not required. Pre-registration for NFB Camp (child-care), is required. $________The NOPBC activities fee is enclosed. Make checks payable to NOPBC. ���The NOPBC activities fee includes all NOPBC-sponsored events for parents, children, and youth. This includes workshops; refreshments at the morning family seminar event on Sunday, July 1; refreshments at NOPBC Family Hospitality; the Braille Carnival; the Scavenger Hunts; etc. It also includes membership-at-large in the NOPBC. It does not include NFB Camp, NFB convention registration, or other workshops or seminars sponsored by other divisions or committees of the NFB.